Home What's On Puppet Ministry – a New Kind of Ministry to look forward too! 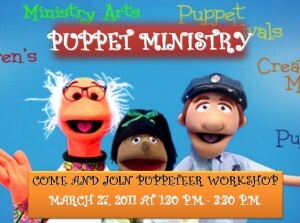 Puppet Ministry – a New Kind of Ministry to look forward too! PUPPETS have caught the attention of audiences down through history helping people laugh, pretend, dream, empathize and learn new ideas. Puppet have become popular teachers through TV show, DVDs, schools and libraries. In the past years puppets have invaded the Church. Group of teenagers, families, teachers, missionaries, and others around the world are discovering an effective “WORK OF THEIR HAND” through PUPPET MINISTRY. But just what puppet ministry? It can be different thing to different people. But it can be a segment of ministry, an effective tool, where several puppeteers and director use puppets to reach out to children. It can also help other ministries to promote activities by performing short skit, drama and song to add excitement on the events. Countless churches, groups, and individuals around the world have discovered the colourful handful of foam rubber, fake fur, and cloth can become a ministry tool with eternal results. Also puppet ministry provides a fun opportunity for volunteers to share their faith and to learn how to work together as a team. So what about you? Why not join and discover the impact puppet ministry can have, both on the lives of audiences and on the spiritual growth of puppet team members. SPECIFIC TRAITS OF PUPPETEERS: Basically anyone makes a good puppeteer, if you are willing to be!!! ü ONE PUPPET FOR EACH PUPPETEER! Acting, Children, Drama, Puppet, Puppet Ministry. Bookmark.